OK we’re going to install the RemUI theme onto Moodle 3.3 and first we must be logged in as an administrator, an admin user, then select site administration on the left, choose plugins and install plugins. We need to choose the file, upload, we would choose this one. This is the RemUI file that we downloaded from Edwiser. Then we install the plug-in from a zip file. Now what it needs to do is check first that version 3.3 of Moodle is acceptable for this version of the plug-in to install and validation successful, so that’s good. We continue, we also need to make sure that the theme folder is writable by the server, if you haven’t done that already make sure that it is writable. So the themes now been added to the themes folder, theme RemUI and to be installed we need to upgrade the Moodle database to show that this theme is now available. So we’ll go upgrade Moodle database now. OK the theme has been successfully installed so we’ll select continue and immediately we get a collection of new options, features, information that we need to add or may need to add for this particular theme. In this case I’m going to leave everything how it is, just so I can show you what the theme looks like. So we’ll just run right down the bottom and we won’t make any changes and just go, Save Changes. And now it’s all installed, so we are right to go and have a look at this theme. 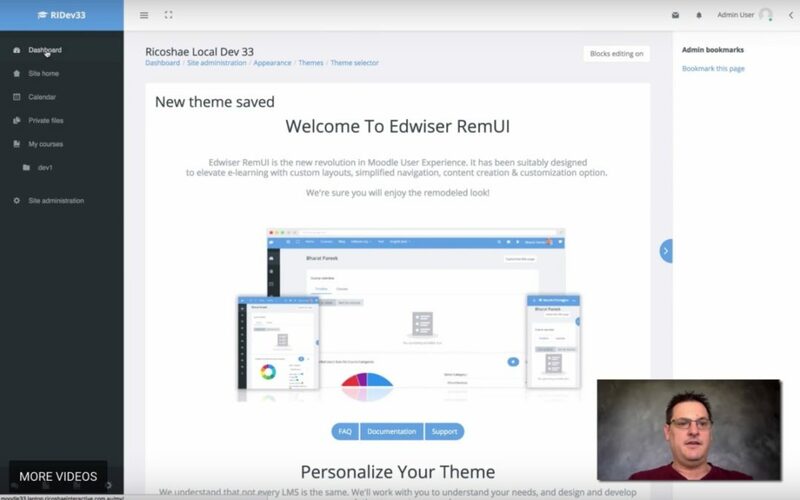 So we’ll go to site administration, select appearance, theme selector, change theme and if we scroll down we’ll find Edwiser RemUI and we will use this theme. And this is now what our page looks like. OK you do have to activate your license, yes that is correct. I’ll just remove that for now. This is the layout that you get with the new theme and it has the right-hand menu or right-hand tab for bookmarks and other blocks. Block editing is now available here which is really really nice. Left-hand menu gives you all of these options, site admin it’s down the bottom and there’s a collection of tabs for the site blog and a collection of options you can click on to get new courses, course archive and the settings for RemUI. Which I’ll just quickly show you one important setting and that is if you open up the right-hand panel at the top right and select a little paintbrush, you can then decide whether you want a dark theme or a light theme and you can set primary, secondary colors here and apply them site wide as well. And inverse the navbar, dark and inverse so there’s a few options there of things you can do to make it look more reasonable. And all the dropdowns, everything looks quite nice and you’re probably wondering what it looks like inside a course because often themes, the front page might look good, but when you go into a course it all changes. So inside this course you can see this is the dev one course and this is the default layout. So in this course I have topic 1 2 3 & 4. Now if I go into test 1, there’s an example. You will see the left hand menu now has drop downs for topic 1, for general and that left hand menu there is basically the course content menu. And over here we just have an activity that we will answer and we will check it, that’s the result we got. So this is the type of look that RemUI gives you and it’s a really really good theme that tidies up a lot of user interface issues that can happen with with Moodle and with some of the other Moodle themes that really are just a template over the the front end. But this one deals right with the whole content, this theme deals with the content as well and makes it all extremely usable and that’s the completion tick actually, it can go green when you’ve completed this page if you’ve got completion on. What I will show you in a future video is how to add the paging, next and back page buttons down here using another plugin that’s been slightly modified, that goes really really well with this theme. If you need to access or need to get a copy of this theme you do need to purchase it, it’s not a free theme and there’ll be a link in the video notes where you can go and grab that theme.